Back in the day, people used to anxiously wait for the mailman to drop off mail in their residential mailboxes. Instead of waiting by the mailbox, people now constantly refresh their email apps to check for new messages in their electronic mailboxes. 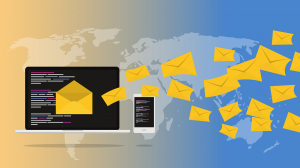 Fast, convenient, and within the palm of one’s hands, email gives users a sense of control, especially since they can check it instantly and don’t have to solely rely on postal mail to receive communication. Unfortunately, however, in the age of online hack attacks, there’s always the risk of losing control of your email if a cyber thief breaks into your account. As a matter of fact, mass email hacks have been making headlines in the news, such as the Yahoo! Data breach in 2013 that compromised 3 billion email accounts. What’s even more astounding is that years can go by before the email providers inform the public that a breach of their databases has taken place. Yahoo! did not inform its users of the 2013 breach until 2016, three years after it transpired. On the surface, email accounts may not seem to have any “monetary value.” After all, they are free, they can be set up in minutes, and anyone can have as many email accounts as he likes. However, thieves view email accounts as “cyber gold” because they can contain messages with credit card information or password details to bank accounts from which they can secretly siphon off money. Email messages also often contain names, dates of birth, addresses, and phone numbers, which can be used to commit identity theft. Expert tech thieves like to carry out full-scale attacks in which they gather thousands of identities from hacked email accounts and sell the information on the Dark Web for a hefty payday. Because of the craftiness of cyber thieves who hack into email accounts, there may be no sign that a person’s email account has been infiltrated, but sometimes, there are telltale signs of a break-in. Here are some red flags to look out for to determine if your email account has been infiltrated, as well as some tips on what you can do after discovering the hack. If you cannot login to your email after several attempts, chances are that your email has been broken into, and the hacker changed your password to lock you out. You find unusual or unfamiliar messages in your inbox. Some hackers don’t change the passwords of the accounts they hack into, so you may be able to login with no problem. However, if you notice unusual emails in your inbox, such as messages regarding password resets for your other accounts that you did not request, then it’s possible that the hacker found accounts sharing the same password with your email and tried to get into them also. Another warning sign is if you see email messages in your sent folder that you yourself did not send. Your contacts are receiving spam messages from you. If your email contacts tell you that they received any spam or strange messages from your email address, then there’s a possibility that you’ve been hacked. Check Have I Been Pwned. Have I Been Pwned is a website created by Troy Hunt, a regional director at software giant Microsoft. Driven to take action after the 2013 Adobe breach that impacted 153 million accounts, Hunt created this site to provide a free way people to check if their accounts have been exposed in a data breach. All visitors have to do is enter their email addresses to run a search. Change your password and security settings. If you’ve been locked out of your account, contact your email provider or go to the Help Center page for assistance. If you have a backup email address registered on your hacked account, then follow your provider’s instructions for re-entry into your account. Whether or not you’ve been locked out of your email and got back in, update your password right away to keep the hacker from getting back into your account. Try to make your password as random as possible by using at least 10 characters and different combinations of symbols and upper and lower case letters. Hackers may have also changed your security questions, so update those as well. To help prevent future email hacks, set up multi-factor authentication that adds an extra level of protection by requiring secondary verification. For instance, common two-factor authentication features require that, after entering your password for your email, a code is sent via text to your phone and must be also entered to ultimately grant you access into your account. Also keep in mind that clever hackers who think ahead may try to keep tabs on your email by setting up mail forwarding so that they receive copies of any future emails that you receive. Check your email forwarding settings to make sure there is no questionable information there. Let your contacts know about the hack. Unfortunately, hackers like to continue their email hacking sprees by using one victim to find more. If your email has been hacked, then it’s very likely that they sent spam emails containing malware to your contacts. Let your contacts know that your account has been hacked right away and advise them to scan their accounts and computers for anything suspicious. Run security scan on your computer. If hackers were able to break into your email, then there’s a chance they may have also tried to infect your computer through malware like spyware that can track and send them sensitive information like credit card numbers. Be sure to have anti-virus and security software on your computer than can conduct thorough scans on your machine for malicious software. Make sure you run this scan before resuming any online shopping with your credit cards. Change passwords and security settings on your other accounts. Email hackers count on their victims to use the exact same password and possibly username for other online accounts they may have. In addition to changing the password of your hacked email account, be sure to update the passwords and security settings on other accounts you may have if they have the same credentials. This will help preempt thieves who may try to penetrate these external accounts.